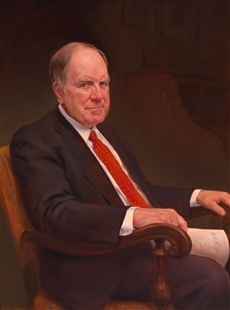 This portrait of Budget Committee Chairman John Spratt was unveiled in 2015. In his portrait, Spratt holds a piece of paper on which the letters B.B.A. are visible – the Balanced Budget Act of 1997. He considered its passage one of his greatest achievements of his 28 years in office.